Push-Ups! No, not that exercise you had to do to get your Presidential Physical Fitness award, but the frozen treat. In a way I liked these better than Popsicles, though nothing touched Fudgcicles. I always remember Push-Ups being only orange sherbet flavor, but this ad for Flintstones Push-Ups shows a variety of fruit flavors. Pretty sure this rap/hip-hop ad came after my Push-Up heyday. I think they also had them on ice cream trucks, although those rarely came to my neighborhood. This woman made a Push-Up flavor smoothie. Yummy! I bought a box of push-ups this summer, for the first time in years. They are still pretty great. We also go through a lot of fudge bars around here. And Fla-Vor-Ice. 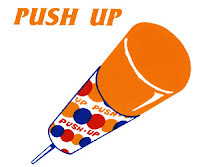 The first Push-Ups I remember we used to get from the ice cream truck in my grandparents' neighborhood. And they were vanilla ice cream with chocolate syrup swirl. I never saw sherbert Push-Ups until the Flintstones ones came around.